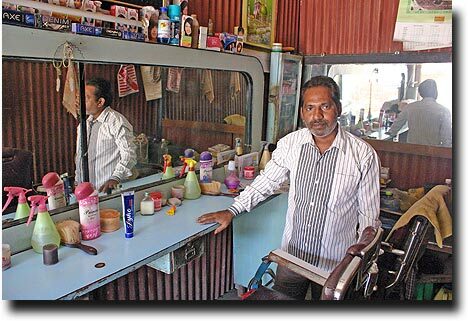 One of the 'photo logs' that I've wanted to make since moving here was the monthly or so walk to the local barbershop. Susan has it tough - she has to go to actual beauty salons, where they charge prices that are remarkably similar to (or even greater than) what she is charge in the USA. I, on the other hand, am a guy, so I can get my hair cut anywhere. I, in fact, am a guy with not really even a full head of hair, so I am doubly blessed. 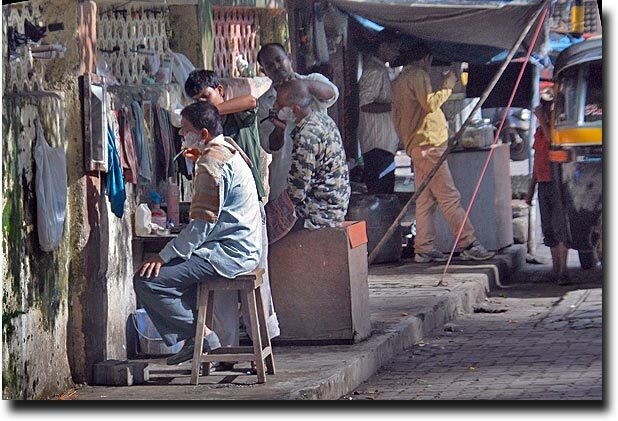 The first time we got our haircuts, they charged my 180 rupees, which was an absolute travesty at 5 bucks. So I found a replacement, and I look forward to the walks through the neighborhood for a trim. 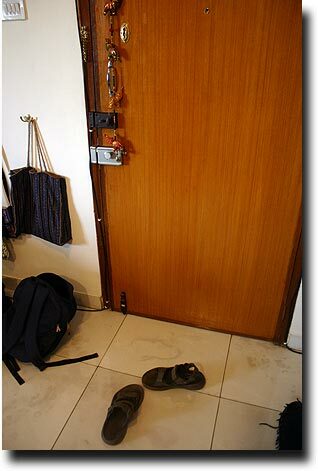 Come along as I slip into the sandals (we always take off our shoes upon getting home - there is so much 'you don't want to know what you just stepped in' on Mumbai streets that there is no way we want to track that around the house), open our door, and wait out in the hallway for the elevator. These are the actual pictures taken on 1 haircut trip (Saturday, February 20, 2010). 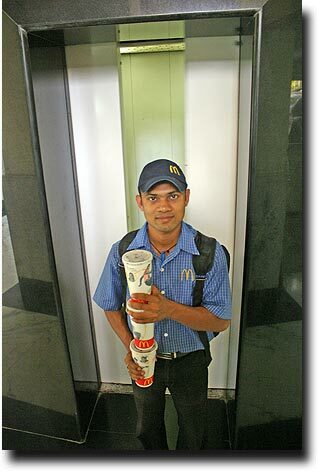 Getting to the ground floor, who did I meet up with but the McDonalds delivery boy. 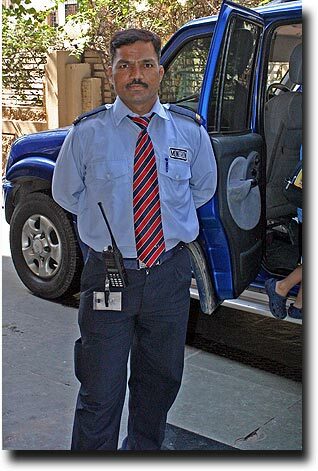 Yes, everything is deliverable here, and once he's passed security with our ever-vigilant guards, he can make his way upstairs to whoever ordered the food. Rough looking bunch of rent-a-cops, aren't they! 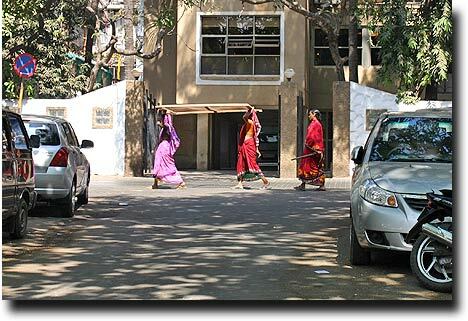 As I walked out into our street, I saw these women walking by with a screen and a shovel. Women are often used on construction projects as dirt haulers and sifters: they will toss shovelfuls of dirt at a screen to get out all the rocks and foreign objects. 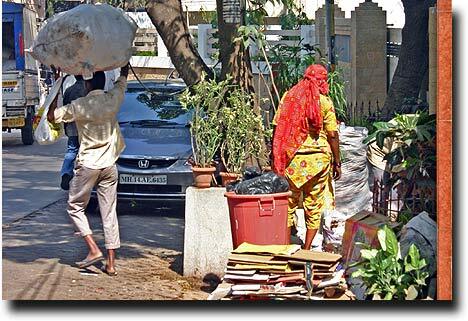 It is pretty amazing to see them engaged in tough manual labor in their flowing and colorful sarees. 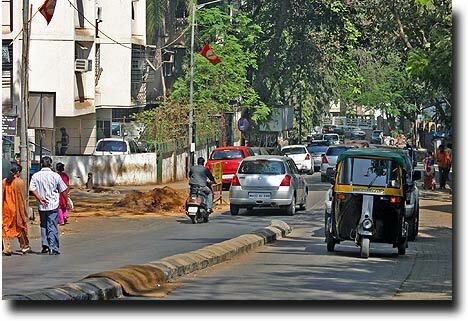 Turning onto the main road, I look to the left and (just barely) see the Arabian Sea, and then turn right and head towards the barbershop (above). Reading the end of the road (standing about where the women were walking), I can see the big fancy house in our neighborhood. 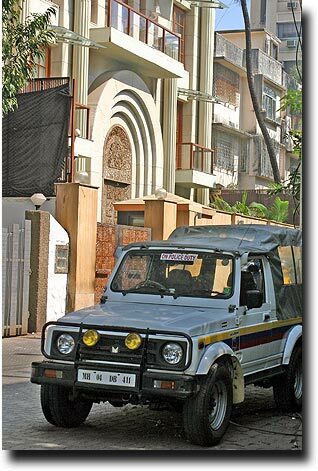 The family that lives there apparently also owns several of the big malls in Mumbai, and we regularly see Land Rovers and fancy cars pulling out of there. 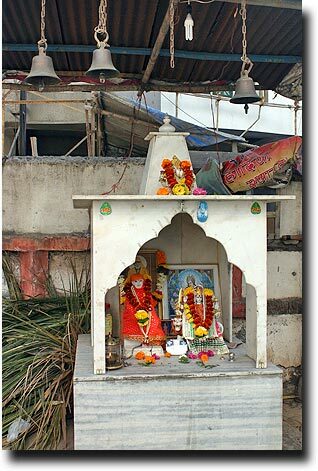 This is the house that sponsors the huge Ganesh celebration during the immersion season. 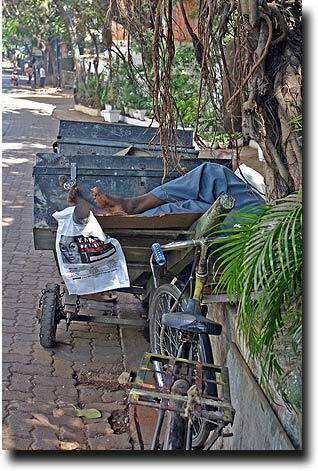 It is nap time for the local handcart-pulling deliveryman (above), but I do get big smiles at the Mumbai version of a 5-and-dime store (left). 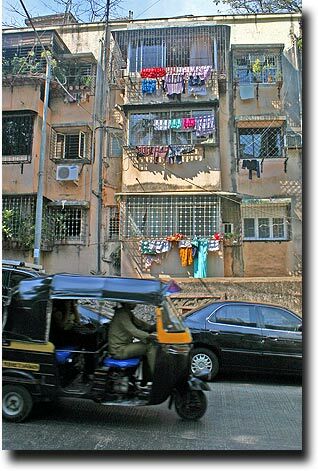 Some laundry is laid out to dry on the shoreline, as we discovered our first month in Mumbai, while other loads are colorfully hung from window balconies. 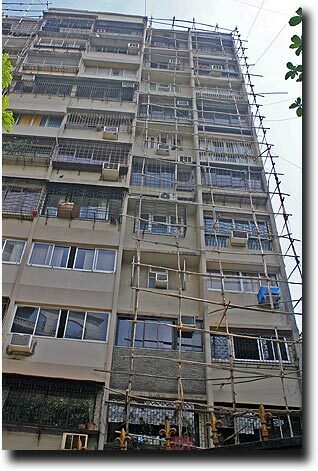 I didn't catch anyone in the act on this trip, but the scaffolding you see above is used for painting or repairs: people climb around on bamboo poles that have been lashed together, usually with no helmets, safety ropes, or shoes. 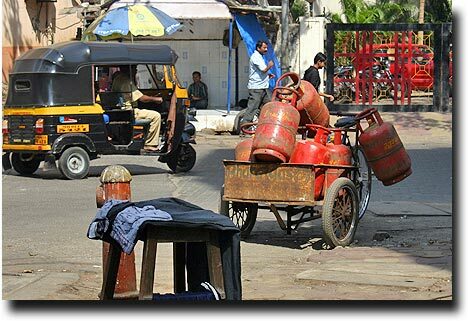 Rounding the final corner, I'll follow the rickshaw to the right, past the cooking gas delivery bike, to get to my haircut haven. 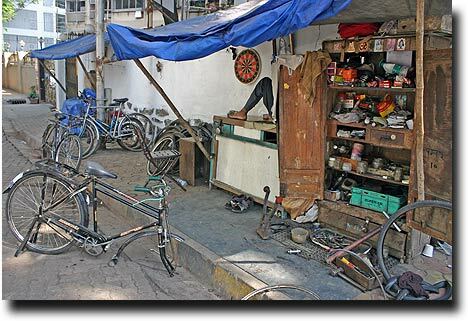 It is also sleepy-time at the bike repair shop, set up in a convenient street-side location so everyone can easily get that work done! Most recycling is done by people who are technically called 'ragpickers' here: they sort through people's garbage and take those items that can be resold. We are encouraged to separate our trash into "wet" and "dry" buckets: those with food and those without. Everything in the 'dry' pile eventually gets reused in some way! 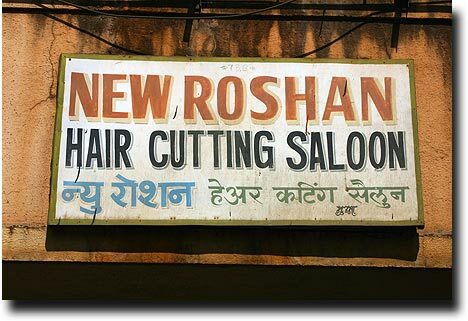 But then, there it is - the New Roshan Hair Cutting Saloon. I'm sure it was the name that attracted me to the shop initially. 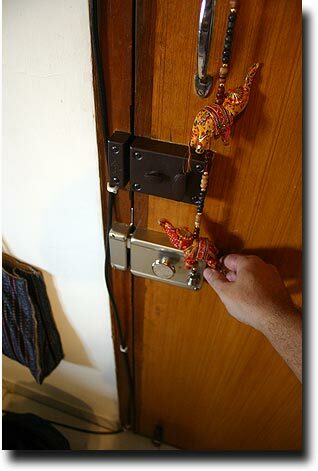 It is nothing more than an emptied out cargo container, set on a cement floor and wired for electricity. There are a lot of outdoor shave and a haircut places around town, but I wanted to go a bit more upscale. On this particular day, there was nobody getting a shave (that is the one picture that I really wanted to get today but didn't see), but there was a neighbor reading a paper in the bright sunlight. 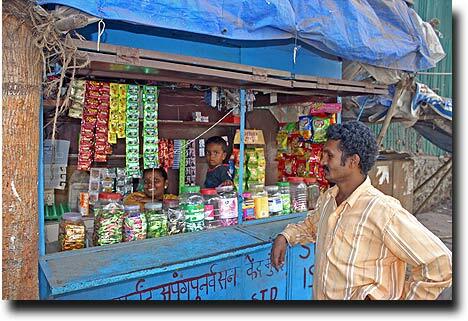 Mahir, the owner, speaks about twice as much English as I speak Hindi, so we have around a dozen words total between us. 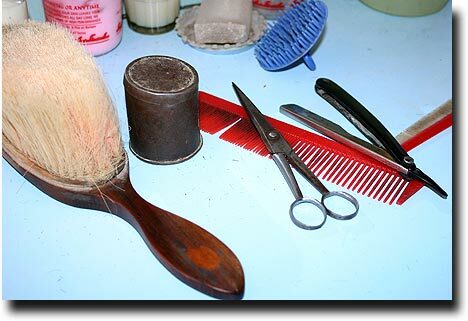 But, for double the posted haircut price (which is by my insistence, not his), I get a by-hand trim, back of neck shave with a straight razor, and head massage (using the tools shown above plus a spray bottle of water). Total price - a dollar. 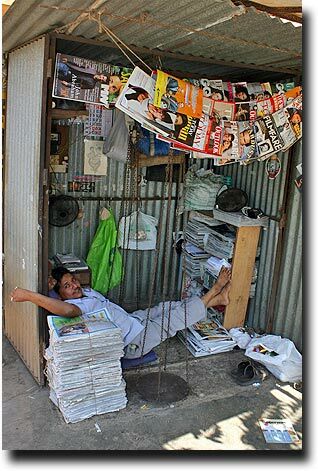 Another recycling effort: bring in newspapers or magazines, get them weighed on the large scales and pick up a few rupees for your efforts. 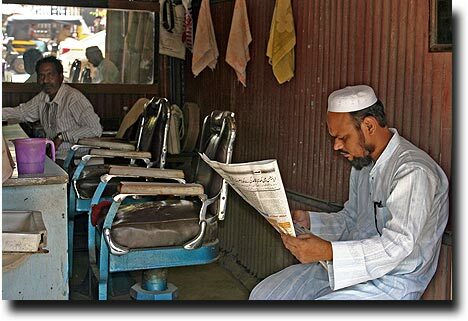 We set aside our newspapers to let our maid get the money for them. Leaving the "saloon" and heading home, I passed a construction zone. 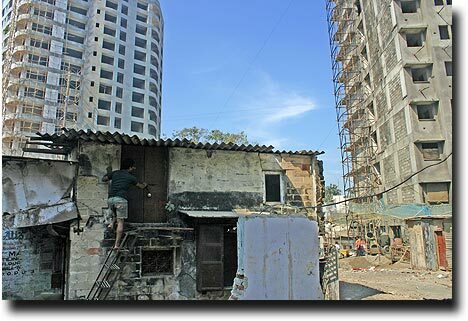 Mumbai is always in a state of rebuilding, and these local homes are being torn down to make way for new apartments. (On the way to school Monday morning, I saw that this hut was now completely gone). 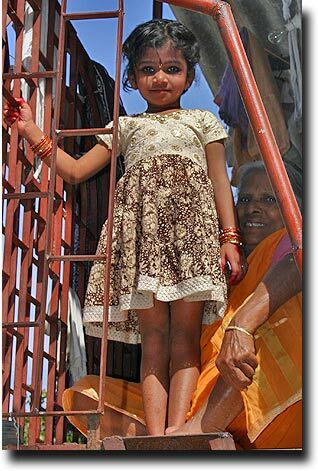 Getting closer to home, there is the shoe shop (where I get repairs and shines done) and a curious smile from a young girl. Her grandmother waved me up to take her picture, so I think I'll have to print out a copy and take it to them. 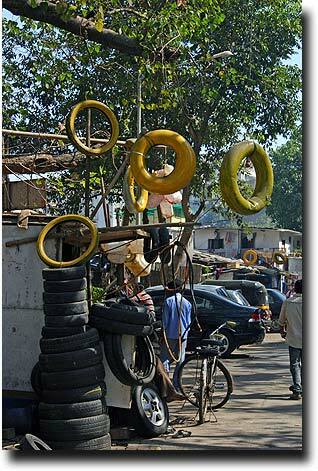 The tire repair shop is very clearly marked as such, and the ubiquitous Sai Baba keeps a watchful eye on the neighborhood. 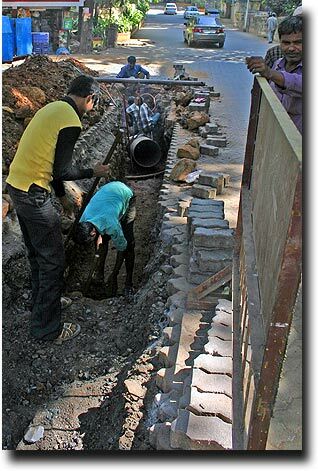 Just around the final corner from home, there is some serious roadwork going on. It looks to me like they are putting in a water line right down the middle of the road. What cracks me up are the safety feature in place: the helmets, steel toed boots, protective gloves, and crowd control barrier. 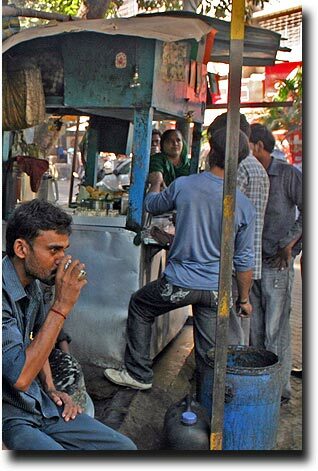 And when the going gets tough, the tough head over to the local tea stall. The man drinking tea is looking directly at the road work (and might even be part of the crew). 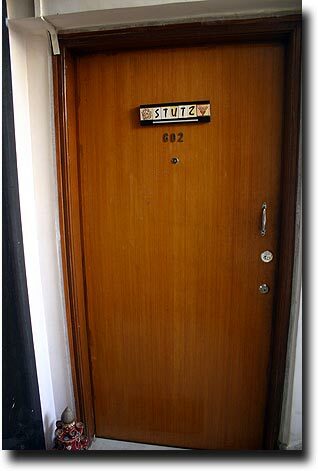 And then - I was home! 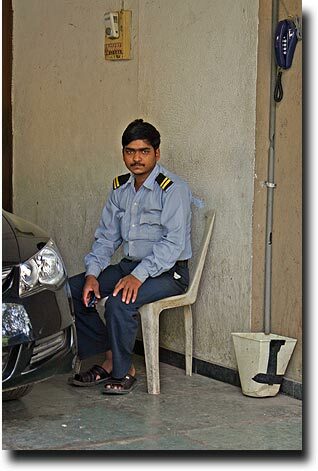 New haircut, new pictures, and another fascinating look at life in India!